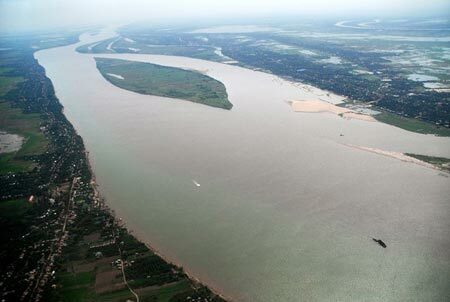 HA NOI (VNS) — The second summit of the Mekong River Commission (MRC) will be held in HCM City on April 5. The information was released by Le Duc Trung, the Office Chief of the Viet Nam National Mekong Committee, at a press conference in Ha Noi yesterday. The Vietnamese delegation, led by Prime Minister Nguyen Tan Dung, will join others from Laos, Cambodia, Thailand, and dialogue partners, China and Myanmar, at the event. The representatives from development partners, donors, and international organisations will also be attending the summit. Themed "Co-operation for Water, Energy and Food Security in Transboundary Basins under a Changing Climate", the summit aims to strengthen the commitment of cross-border cooperation in the sustainable development of the Mekong River Basin's water resources. This is a pressing demand along with the need for water, energy, and food resources. The summit will highlight the will and political commitment of leaders from the MRC member countries to enhance regional affiliation in overcoming all challenges for the sustainable development of the Mekong River Basins. The meeting will also outline priority areas for the MRC in the immediate future, especially in ensuring water, energy, and food security and reducing the impact of climate change. The leaders are expected to release a joint statement at the end of the event. According to Trung, on the threshold of the summit, an international seminar will be held from April 2-3 to discuss regional and global issues of common concern, such as water, energy, and food security, risk management and climate change adaptation in transboundary basins.